Duchess threw a gorgeous litter of wolf dog puppies. Three (3) of the wolf hybrid puppies are black phase - or pure black. There are four dark puppies which may be tri-color. When wolf dogs are born they are typically darker and will lighten a bit if they are tri-color. The mother, Duchess, is a black phase wolf dog. Duchess is the granddaughter of Shika. Her father was black phase. Duchess is Mackenzie Valley and Timber Wolf mixed with German Shepherd and Malamute. The father is Titus, a very high content Timber Wolf dog with a very small percentage of Malamute. This litter was born December 13, 2011. Onyx - Female - Wolf Hybrid Puppy for sale Mackenzie Valley and Timber Wolf. CKC Registered. Sold Jet - Male - Wolf Hybrid Puppy for sale Mackenzie Valley and Timber Wolf. CKC Registered. 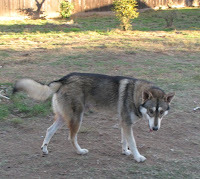 Achro - Female - Wolf Hybrid Puppy for sale Mackenzie Valley and Timber Wolf. CKC Registered. Joel - Male - Wolf Hybrid Puppy for sale Mackenzie Valley and Timber Wolf. CKC Registered. Luna - Female - Wolf Hybrid Puppy for sale Mackenzie Valley and Timber Wolf. CKC Registered. Stan -Male - Wolf Hybrid Puppy for sale Mackenzie Valley and Timber Wolf. CKC Registered. Lucy - Female - Wolf Hybrid Puppy for sale Mackenzie Valley and Timber Wolf. CKC Registered.